Thrissur known as “Tiru-Shiva-Perur’ is a town named after Lord Shiva. Lying in Central Kerala, it is known for its several popular shrines. The Vadakkumnathan Kshetram, where the reigning deity is Lord Shiva, is situated on a hillock in the heart of the town. Exquisite murals here narrate the epic of the Mahabharatha. 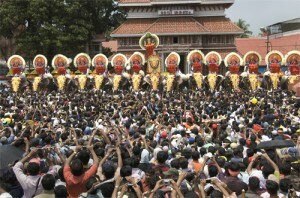 This temple is especially known for its spectacular celebration of the Pooram festival, which is conducted in April at the ‘maidan’, opposite the temple. It is a magnificent spectacle with nightlong fireworks and a splendid procession of elephants. 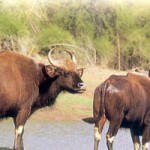 Chimmini Wildlife Sanctuary: It is located 35 km from Thrissur District. Principal faunas here are Leopards, Elephants, Bears wild pigs, Wild boson Tigers etc. This entry was posted in Kerala, Thrissur and tagged about thrissur, Chimmini Wildlife Sanctuary, thrissur district, thrissur kerela, Tiru-Shiva-Perur. Bookmark the permalink.